View northward, towards Ambergate and Manchester/Sheffield on the main lines north from Derby. (See also SK3443 : 'Jubilee' Class 4-6-0 'Leander' north of Duffield and others nearby). The Up Class H freight is headed by ex-WD 2-8-0 No. 90607, which was built as No. 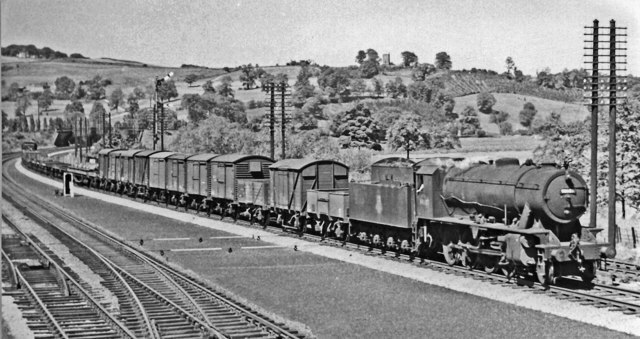 7463 (later 77463) in 1/44 and loaned to the LNER at Colwick until shipped to France in 12/44: it returned to England in late 1946 and was stored on the GW at Kingham until acquired by the LMR (Central Division) in 11/49, where it remained (as No. 90607) until withdrawn in 11/62.